Outdoor banner stands make great portable outdoor signs for outdoor events, trade shows, and venues. They can be used for outdoor advertising to highlight products, services, or sponsors, or on a sidewalk to get patrons into your store. They can also be used as directional signage at any outdoor venue, such as sporting events or theme parks, to direct people to special events or attractions. These outdoor banner stands are designed to stand up to the outdoor elements, such as rain and normal wind conditions. The base units can be weighted down with sand or water so they are stable. Our outdoor banner stand graphics are printed at 720 dpi resolution onto a premium outdoor banner vinyl with UV inks, so they are weatherproof and fade resistant right off of the printer. Therefore, these outdoor banner stands are very cost-effective, rugged, and portable outdoor signs that can be used virtually anywhere. 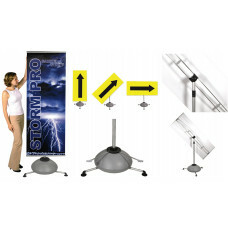 The Storm Pro has a relatively small base for an outdoor banner stand, making it very portable and v..